With the sixth selection of the 2018 NFL Draft, the Indianapolis Colts have selected Quenton Nelson. 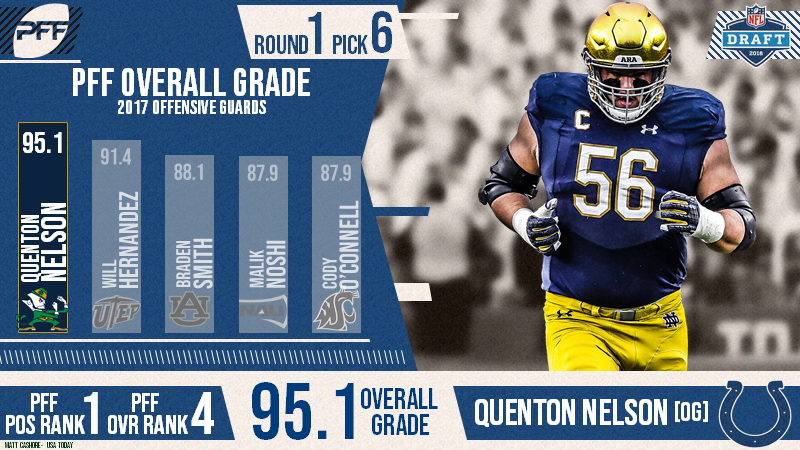 The former Notre Dame star was selected sixth overall after finishing the 2017 season with an 95.1 overall grade, the highest grade for a guard across the entire nation and the second-highest grade we’ve ever given to a guard in the PFF College era. Nelson’s grade was nearly 4.0 points higher than the next closest in the class. He ranked sixth among draft-eligible guards in pass-blocking efficiency in 2017 (99.0). Nelson ranked first among draft-eligible guards in run-blocking success percentage in 2017 (94.6).